MEADOW LAKES — A Wasilla animal control officer this week liberated a young alligator from a bathtub. Wasilla Police Department's Mikey Rager got the call on Monday: a 3-year-old American alligator was living in the bathroom. Long story short, rescuers say, the 4 1/2-foot-long gator was outgrowing the tub and its owner called for help. By 10 a.m. Tuesday, Allie the Alligator had a new home about 15 minutes away at Valley Aquatics & Reptile Rescue in a strip mall along the Parks Highway. "Our animal control officer typically handles loose dogs and cats, with the occasional rogue chicken thrown in," the police department posted on its official Facebook page Tuesday. "Yesterday was a first for him…"
There's no law against keeping an alligator in Alaska, according to Ken Marsh, a spokesman for the Alaska Department of Fish and Game. But experts say it's ill-advised given the cold dry climate and inherent risks. Valley Aquatics is full of reptiles from homes unable to keep them: nine turtles; a ball python; a 9-foot-long Colombian red-tailed boa named "Mouse." The alligator was treated well and looks very healthy, said Nadine Rawlings, the manager of Valley Aquatics. Rawlings thinks the gator is a male. The previous owner kept Allie in the tub but sometimes would put a band on its snout and let it walk around and dry out. The gator likes to be scratched under the chin, as seen in a video Valley Aquatics posted on Facebook. For now, Allie is living in a 100-gallon tank. But the rescue plans to fashion a holding pen from a combination of donated water troughs and a dry-out area. The pen will be secure, Rawlings said: "No fingers, no unauthorized entry or touching." She and owner Sheridan Perkins are trying to find a nature reserve in Florida to take Allie. There's little chance anyone in Alaska would have the resources to take the gator here. The gator is still young enough that it makes duck-like squeaks, like a call to its mother, when it's time to eat. But Rawlings notes that American alligators can grow to 12 feet long and 700 pounds. "It's an animal that shouldn't necessarily be a pet," she said. Meadow Lakes is no stranger to famous reptiles with problems staying at home. A 17-foot albino Burmese python weighing 100 pounds triggered a snakewatch in May — and no small amount of panic — when it went missing from a Meadow Lakes home only to be found, safe, some days later. 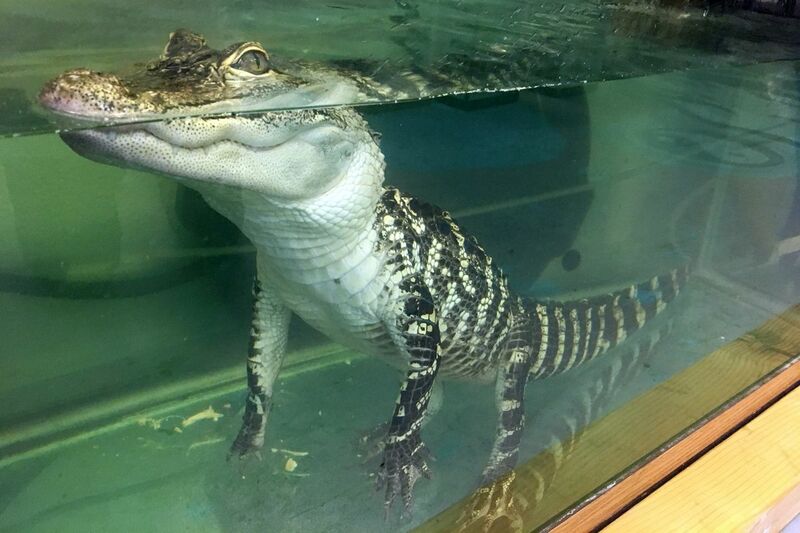 Alligators don't normally make the news in Alaska, though one that disappeared from the greenhouse at Palmer High School made headlines in 2003. Someone posted a comment on the police department Facebook page Tuesday about not needing "alligators plus bears" in Alaska's predatory suite. "Thankfully a feral alligator population isn't going to be a concern in the near future," the department administrator replied.